Can you celebrate National Doughnut Day and still be fierce? Absolutely! Today’s Friday Five is all about the doughnut! 1. The Origin of National Doughnut Day. 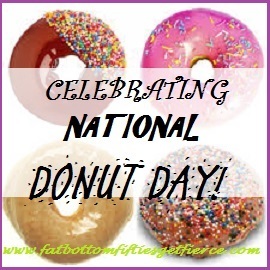 According to Wikipedia, National Doughnut Day started on June 7, 1938 when a young military doctor by the name of Morgan Pett stopped at a bakery and picked up 8 dozen doughnuts on his way to a military base he’d been sent to. As he tended the wounded soldiers, he gave each a donut. One of the soldiers, a Lieutenant General by the name of Samuel Geary appreciated the help on his leg, and the doughnut. He and Dr. Pett teamed up to make a fund raiser to give every wounded soldier and the needy a doughnut. This fund raiser was later joined with the Salvation Army during the Great Depression as a way to raise funds and bring awareness to their social service programs. It’s celebrated each year on the first Friday of June. 2. A side celebration. 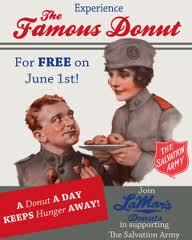 National Donut Day also commemorates the “donut lassies,” female Salvation Army volunteers who provided writing supplies, stamps, clothes-mending and home-cooked meals, and of course, donuts, for soldiers on the front lines. 5. It finally makes sense. After years of wincing whenever I heard this goofy expression, I can finally relate to it!